Prior to the Formation of The Garden Room. Clive and his Team, “The No 1 Chosen Installers” for the Top 3 UK, Garden Rooms, Garden Offices, Studios, Spaces Company’s. With over 10 years of First Class Installation.The Team, not only Highly Skilled and Knowledgeable in Erection/Installations. Project Management from Start to Finish, Inc. Ground works, Electrical, Plumbing, Painting, Glazing (Not so much master of all, but Using the Best Skills of the Team) Most of our now competitors Galleries are Largely showing Finished Projects built by the Now “The Garden Room Company” Due to Copyright Restrictions and direct competitors, it’s not possible to share the Past Completed Projects. 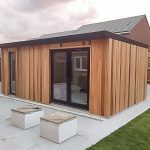 The Garden Room Company, Is a Professional Company, With a highly experienced and Skilled Team.We offer Insurance Backed Guarantee.All architectural drawings are indemnity Insured. The GRC work with Homeowners, Architects and completely Project Manages from Start to Finish. First Class Team Take Great Pride in their Work, Respectful to not only the Client, Family Members, other trades. Often overlooked, Respectful and courteous to adjacent neighbours. Parking with Thought. We have long term Values of Honesty, integrity with Exceptional attention to detail. All our Testimonials are Real People/Clients. Words have not been changed.